Every now and then someone special comes into your life, real genuine people are few and far, and this is the case with my Sista Mojiba, Moji, I Am, Count Ossie Pickney. Now I must say thanks to Facebook. For I have made many great friends on there, and Mojiba is at the top of my list as one of these very rare people that I have come to reason with and grow to love. She is the most compassionate, kind, loving, caring, genuine, considerate, unselfish, considerate, and spiritual, words alone really can’t explain truly how I feel. She brightens mine and many others days with her radiant smile and glow, positive energies, authentic poetry and incomparable strength and beauty, she is like a tree with so many different fruits. Although I have not met her as yet in the flesh, I feel as I have know her all my life, I could write so much more about mojiba and maybe one day I will write a book about this most amazing soul. I am and forever will be humbled and blessed by your very existence. “Femininity is not just lipstick, stylish hairdos, and trendy clothes. It is the divine adornment of humanity. It finds expression in your qualities of your capacity to love, your spirituality, delicacy, radiance, sensitivity, creativity, charm, graciousness, gentleness, dignity, and quiet strength.” J. Faust. It's a high energy frequency to be surrounded by the aura of this beautiful and intelligent Empress. Highly energetic and creative; there's no limit to her creativity. 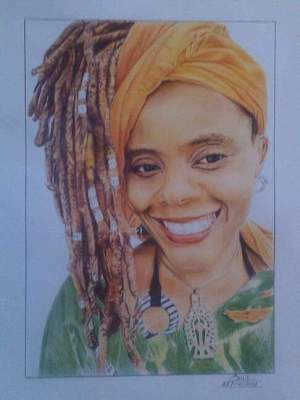 Inspirational and motivative and has helped me on my spiritual journey so I give thanks Empress. One Love and Blessings. Who are you? Cause you always uplift me with words, you think before you ink, lol. You are an incredible woman. I live with epilepsy but the words you always write, they always lift ma spirit sister, now I am no longer feeling isolated because of your words. Thanx sister, I always wanted to be a poet when I was young, but since I develop seizures my memory is no longer the same but keep on praying that God can help me bring back my memory.